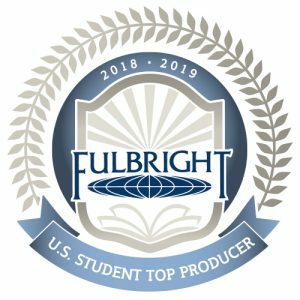 TUSCALOOSA, Ala. — For the third time in four years, The University of Alabama was recognized as a Top Producing Institution for Fulbright U.S. Students. Each year the U.S. Department of State’s Bureau of Educational and Cultural Affairs announces the top producing institutions for the Fulbright program, the U.S. government’s flagship international educational exchange program that seeks to increase mutual understanding between people of the U.S. and people of other countries through cultural exchange. Fifteen of the 39 UA student applicants – 38 percent – for 2018-2019 Fulbright grants received the distinguished accolade. Among SEC schools, only the University of Georgia and University of Tennessee had more Fulbright grantees with Georgia’s applicants being awarded 16 Fulbright grants out of 43 applicants, or 37 percent, and Tennessee being awarded 19 out of 52 applicants, which is 36.5 percent. The Ivy League institution Brown University topped the list with 35 of its 106 applicants – 33 percent – receiving Fulbright grants. “We’re extremely proud of our applicant-to-win ratio,” said Megan Wagner, coordinator for the Capstone International Center and coordinator of the U.S. Student Fulbright program at UA. Dr. Teresa Wise, associate provost for international education, underscored that UA’s focus on instilling its students with a global perspective throughout their time at the Capstone contributes to their success in Fulbright applications. Dr. Beverly Hawk, UA Fulbright program adviser and director of global and community engagement of the Center for Community-Based Partnerships, said the Fulbright competition offers fully funded grants for independent study, research and English teaching assistantships overseas for 10 months. The highly competitive program selects approximately 1,800 award recipients from over 11,000 applicants each year. Thirteen UA graduates won awards as teaching assistants, and two UA graduates received Fulbright awards for research and study for the 2018–2019 academic year. UA’s 15 winners were announced in May. Wagner said the goal is to have at least 25 Fulbright grant winners next year. “We’ve had 15 winners for two years in a row now,” Wagner said. “We’d love more students to apply. Students interested in applying for next year’s Fulbright program can learn more at international.ua.edu and us.fulbrightonline.org, or by sending an email to beverly.hawk@ua.edu or mfeminella@ua.edu.